In the heart of Regensburg’s Altstadt you can find the Altes Rathaus building. It sounds rather amusing in English – the idea of lots of “rats” living here (and maybe there were in medieval times) . The word Rathaus like many others in German, is a combination of 2 words, “Rat” meaning council and “Haus” meaning house. Regensburg’s Altes Rathaus is quite close to the Old Stone Bridge that we visited in last week’s post on Regensburg (see here). It is actually a combination of 3 buildings fronting onto a quaint cobbled square dotted with little cafes and shops. The complex, originally begun in the 13th century, consists of the Town Hall Tower, the Gothic Imperial Chamber Building (in which the Perpetual Imperial Diet met from 1663-1806) and the baroque Town Hall. Access is by guided tour only, which we didn’t have time to organise, but apparently the basement houses the dungeons with an original torture chamber (hopefully not in current use!). You will find Regensburg’s tourist office on the corner of Rathausplatz too. Altstadts have such interesting characters and stories – the old stone walls must house so many secrets! 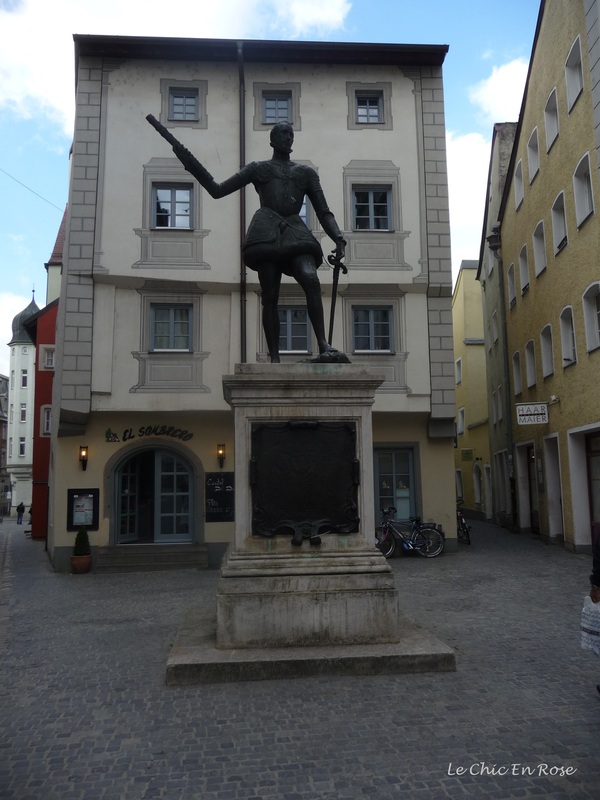 We came across an impressive-looking statue of Juan Of Austria (Don John Of Austria). I later discovered Juan was the illegitimate son of the Holy Roman Emperor, Charles V and Barbara Blomberg, daughter of a Regensburg Burgher. Apparently she enjoyed a brief liaison with Charles when he was in town for the Imperial Diet one year and young Juan was the result. Sadly for her he was whisked off to Spain to be brought up in secrecy and later served his half brother, Philip II Of Spain, in the Spanish Army, becoming a renowned military commander. He was particularly noted for leading the Holy League of Spain, Venice and Papal forces in a naval battle against the Ottoman Turks, which resulted in their defeat at the Battle Of Lepanto in 1571 in the Eastern Mediterranean. 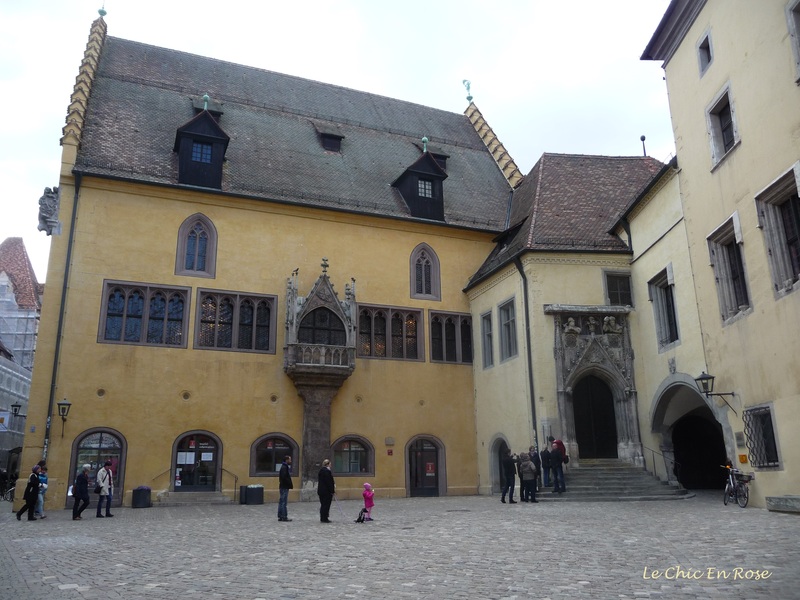 Another fine historical building is the Schloss Emmeram, which contains the former monastery of St Emmeram as well as the castle and family seat of the Thurn und Taxis family. We only had time to skirt round the perimeter and peer through the entrance to the Fuerstliche Brauerei, which is housed in the old palace. With a museum and a shop too there looked to be enough to keep visitors occupied for a good half a day. The Thurn und Taxis family originated from Italy and made their fortune by effectively founding an international postal service. Franz Von Taxis had devised a well organised courier service in Italy and around the turn of the 16th century his system was expanded. In those days a letter could be transported from Innsbruck to Brussels in 5 and a half days! In 1615 as a reward Emperor Matthias awarded the family the hereditary right to be imperial postmasters general. Eventually by 1748 their fortunes had risen to the point where the Emperor Franz I made Prince Alexander Ferdinand Von Taxis the principal commissioner, the Emperor’s representative, at the Perpetual Diet in Regensburg with the proviso that the family relocate to the city! They certainly built themselves a magnificent palatial home there in the grounds of the old abbey! From the Emmeram Palace, it is only short walk via St Peter’s Weg back to the Hauptbahnhof (main railway station) and the start of our day in Regensburg. We really enjoyed our time in this lovely old city with its winding streets, charming cafes and beautiful old buildings. There is so much more to see here – my little tour has really only touched on a few highlights! Cafe Prinzess Regensburg – the first coffee house in Germany. It was opened in 1686 in the Rathausplatz. Really enjoyed the tour of Regensburg Rosemary – very intrigued by that dungeon and torture chamber, sounds gruesome but fascinating!! Seems like a great little town to wander and explore, definitely somewhere I’d like to spend time. Goodness Rosemary those photos are beautiful! The first one took my breath away!